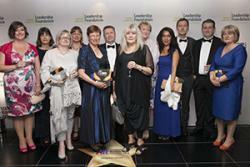 Members of the WHELF Shared LMS team with their award. Flora Lewis (far Right) represented Bangor University at the event. : Image courtesy Times Higher EducationBangor University Library and Archives Service have received the Outstanding Library Team Award, presented at the Times Higher Education Leadership and Management Awards 2015, along with other Welsh partners in the Wales Higher Education Libraries Forum (WHELF). WHELF comprises the National Library of Wales, all the Welsh universities, the Welsh NHS Libraries, the Open University in Wales and the Royal Welsh College of Music and Drama. The judges described WHELF as an “ambitious project” that “shows great trust, ability to develop a shared vision and achieve impressive cross-organisational alignment and coordination”. “As well as cost savings on procurement and infrastructure, the partnership approach will improve discovery and ultimately access to library resources for all users in Welsh universities, the National Library of Wales and further afield,” the panel said. The WHELF project, the first of its kind within UK higher education, has secured funding through Jisc and CyMAL (Museums, Archives and Libraries Wales). Facilitated by Cardiff University, which chaired both the working and the steering groups, it has been a genuinely collaborative process, with all the member libraries playing a full and active part. Given their geographical distribution, this has involved video-conferencing and shared online spaces for storage and real-time production of essential documentation. The winners were chosen by a panel of judges including Alison Johns, Chief Executive of the Leadership Foundation for Higher Education, David McBeth, Director of Research and Knowledge Exchange Services at the University of Strathclyde, and Maja Maricevic, Head of Higher Education at the British Library.